For last week’s challenge, I needed some chicken stock. I could buy some, but really, why? Making stock is super-easy and mostly unattended. It’s a good way to spend a Sunday afternoon, especially if it’s a rainy one like the day we made this batch. Now, I could have made the long version of Jaden’s Pho but at the time, I had no idea how well it would come out or if we would like it well enough to keep extra pho stock on hand. 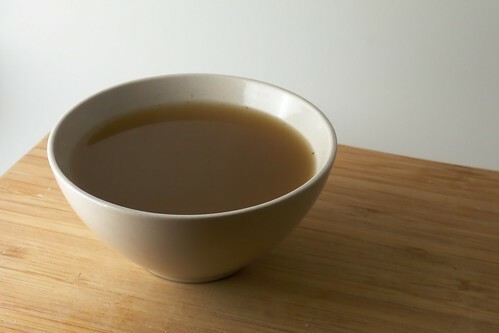 So, instead, I put together a recipe for a very basic chicken stock that would work well in being flavored for pho. Many chicken stocks call for thyme and I agree – fresh thyme is a wonderful thing. I’m going to try growing it again eventually but for now, acquiring some is about a 50 mile round trip journey and frankly, I needed to use up the last of the fresh rosemary. Use what you have and if you don’t have fresh, use dried. It’ll still work, though it won’t be as nice. Cut apart the leg quarters at the joints and leave the skin on. In a large skillet, heat the oil over medium heat and fry the chicken quarters with a bit of salt and rosemary until nice and brown. Remove those to a large stockpot and cover with water. Start heating the water on high. Add a bit more oil to the pan and dump in the onions, garlic, carrots and leek or green onion. Here you want the flavorful tops, so don’t throw out the leek tops if you’re using that. Saute the veggies until they get a bit of color then dump them into the water with the chicken. Deglaze the pan with white wine and when all the browned bits (the “fond”) have been scraped up, dump the resulting mixture into the pot. Add the peppercorns along with the rest of the rosemary. Make sure there’s enough water to cover everything by about an inch. By now it should be getting close to simmering. Bring it to a full boil, then cover it and let it simmer for 2 – 3 hours. Every so often, skim the fat and other impurities from the surface. Using a fine-meshed sieve, drain the stock into a large bowl or container. Throw away all of the veggies — trust me, they’ve given their all. Strip the meat from the bones and reserve for some other recipe needing boiled chicken, like chicken noodle soup or chicken salad. Let the stock cool to room temperature then refrigerate overnight. The next morning, remove any fat that’s solidified at the top. Pour into smaller (1 or 2 cup) containers and freeze, making sure to leave enough headroom. This entry was posted in chicken, dairy-free, gluten-free, soup, untranslated. Bookmark the permalink. My life and all of my cooking changed once I started using homemade stock. We make various types, depending on our moods and what foods we’re working with at home–chicken stock, beef stock, seafood stock and even straight veggie stock have graced our freezer. I’ll never go back to the store-bought stuff again. I’ve found your site for the first time today and I love it!! You are doing great work here. Keep it going! Daniel: Thank you! :) I don’t know why I never made stock before now when it’s so simple and comes out so well. Of course, losing access to my favorite store-bought brand certainly helped me along! Some folks swear by it, though it’s never worked well for me. I have a hard time getting the cubes to separate after I put them into a baggie! So I stick with little tupperwares in varying sizes.